Can you make every lift feel the same? 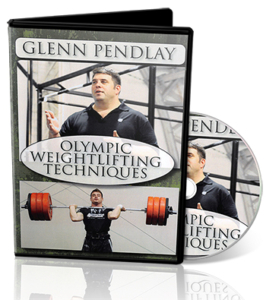 Glenn Pendlay talks you through the essential positions of the Olympic Lifts that you need to hit every time. Now what we want to do is go into lifting from the floor. That is why I had some of you put the plates on if you are able. If you were not able to put a plate on your bar, when we get to that point, you will just have to go down to a place where the bar is at your shin or it is approximately as high as it would be if you did have a plate on your bar. For those with a plate on the bar, you will be able to actually go down and touch. We are going to continue to lift from the top down. Jon is going to pick the bar up, and go to his power position, or the first position. Notice the shoulders are staying back and he is on his heels—now he is going to go to below the knees—to the second position. Notice his shoulders are still back, he is still on his heels. Now, he is going to be in the first position by bending his knees. He is going to the second position by bending at the hip. Now, he is going to go to the third position, or on the floor, but once again by bending the knees. If you will notice, not only did he go down to the floor by bending his knees and maintaining a constant hip angle, but his weight shifted from his heels to be ball of his foot, or somewhere on the forefoot. That is very important: You are on your heels in the first position, you are on your heels in the second position. As you go to the floor, the weight shifts forward. Now as he picks the bar back up, we are going to stop in each position again, as he goes from the floor to the bottom of his knee we are going to do that by extending his knee. His knees are going to move back, and when the bar gets to the bottom of the knee, his weight is going to be back on his heel. Weight is back on his heel, the knees have straightened, his back angle stayed constant, now you are just reviewing what you have already done. Pushes the bar in, extends the hip, extend the knees to jump. Go. Down to a catch. We are going to do that one more time. Shoulders back; bend the knee; bend the hip; bend the knee again. Extend the knee; extended the hip; extend the knee again. There you go. I want everybody to go through that several times, stopping in each position. Remember, there is nothing to be gained by going faster than you can do it properly. I want everybody to go very slow, stop in each position. Every time you stop, think a little bit, and take stock of where you are, what position you are in, how it feels. If you go back to it, you can recognize that position, and you can hit the exact same position every time.